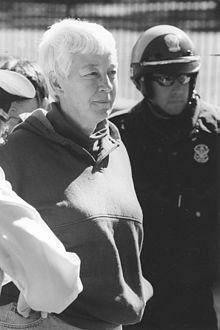 Elizabeth McAlister being arrested at a 2001 anti-nuke protest. On this Martin Luther King Day, Midday's special edition celebrates the man who brought the philosophy of non-violent protest to a broad public. It seemed to us a good time to update you on the story of Elizabeth McAlister, who has devoted her life to the cause of non-violence. Elizabeth McAlister is a former nun who was married to Philip Berrigan, a former priest. He was a member of the Catonsville Nine, activists who burned draft files in the parking lot of the Catonsville Draft Board in 1968. They served time in prison, and they inspired a number of other anti-draft and anti-war protests in the 1960s and 70s. Philip’s brother was the activist and poet Daniel Berrigan. Philip Berrigan died in 2002. Daniel Berrigan passed away at the age of 94 in 2016. In 1973, Philip Berrigan and Elizabeth McAlister founded Jonah House, a faith-based community of peace activists dedicated to non-violent resistance. It is located in West Baltimore. Currently, there are five people living there. The activism of the Catonsville Nine in the 1960s evolved, over time, to what have come to be known as “Plowshares Actions,” inspired by the Biblical passage from the prophet Isaiah which says, “they will beat their swords into plowshares.” Beginning in the 1980s, activists in the United States and elsewhere have concentrated their efforts on protesting nuclear weapons. On April 4, 2018, the 50th anniversary of Dr. King’s assassination, Elizabeth McAlister and six other protesters cut fences and entered the King’s Bay Naval Base in Southeast Georgia, to protest the United States' nuclear weapons arsenal. King’s Bay is presumed to be the home base for several Trident-missile armed nuclear submarines. The protesters were arrested and charged with criminal trespass and destruction of government property, and they are still awaiting trial in Federal District Court in Georgia. Four of the protesters accepted terms of release before trial that allowed them to return to their homes. They are required to wear ankle bracelets, and their travel is restricted. Elizabeth McAlister and two others, Fr. Steve Kelly, a Jesuit priest from the West Coast Province, and Mark Colville, a Catholic Worker from New Haven Connecticut, chose to await trial in the Glynn County Detention Center in Brunswick, Georgia.